Marrakesh is the second of our double suites, beautifully furnished with exquisite Moroccan lights and hand painted furniture. The woven sequin bedspread is a traditional Moroccan wedding blanket, and the floor kelims were hand woven in the rural towns of the Atlas mountains. There are stories everywhere!. The suite also features an en suite bathroom with spacious mosaic tiled shower (and not a bath), and opens up onto a furnished screened veranda where you can sit and relax in the garden, with private access to the parking area. 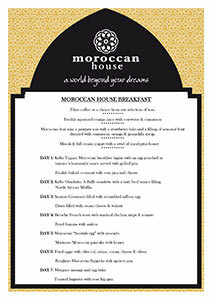 A scrumptious 3-course Moroccan breakfast is included ( from 7am-10am). We also offer a complimentary range of teas, freshly ground coffee, home-made rusks, rose and hibiscus cordial, orange juice, bottled water and Coke. All rooms, interiors and public areas are strictly non-smoking. Those wishing to smoke may do so outside the suites on the veranda. Please notify us by 15h00 if you wish to have dinner with us. Your choice of a three course candlelight dinner will be served at 19h00 in La Riad (subject to availability), alternatively dinner will be served on your veranda. Unfortunately dinner is not available on Sunday evenings or public holidays. Children over the age of 12 are welcome, but will be charged as adults. Cancellation within 8-30 days of arrival date, 50% deposit forfeited.